This book is the first English language study of Qian Qianyi (1582-1664) - a poet and literary critic during the Ming-Qing dynastic transition. Although Qian’s works constitute some of the greatest achievements in pre-modern Chinese lyric poetry, they have been largely understudied and are poorly understood. Qian was reputed for his own aesthetic that changed the character of late Ming and early Qing poetry. His name, however, was branded with infamy for his disloyalty to the Ming dynasty when it dissolved. Consequently, his works were censored by the Qing court and have been forgotten by most critics until recently. 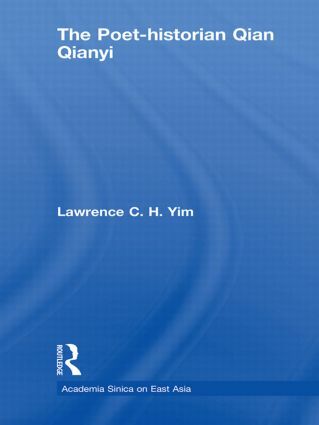 Lawrence C.H Yim focuses on Qian’s poetic theory and practice, providing a critical study of Qian’s theory of poetic-history (shishi) and a group of poems from the Toubi ji. He also examines the role played by history in early Qing verse, rethinking the nature of loyalism and historical memory in seventeenth-century China. Poetry of the Ming-Qing transition is distinguished by its manifest historical consciousness and the effort and give meaning to current historical events, an effort characterized by the pathos of introspection and mourning for the past..This pathos translates into what can be called a poetics of Ming loyalism, exemplified and championed by, intriguingly, the later works of Qian Qianyi himself.